Greek Salad, Have Some Today! 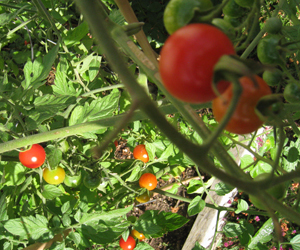 It’s tomato season! That blessed time of the year when honest, sun-ripened, fruits-of-the-gods are bending vines from Portland to Pireaus. Typical of many cultures, other than the North American, Greeks traditionally eat their big meal in the midday, followed by a rest before heading back to work. The evening meal will be something light, salad and bread, for example. The traditional Greek salad (Horiatiki) is on every menu this time of year. It’s quick and easy to make, pretty to look at and perfectly healthy to eat. Arrange the tomatoes, cucumber, onion and olives on a platter or shallow bowl, toss or not, drizzle with olive oil, top with the cheese and sprinkle with oregano. Put the platter in the middle of the table and share. Soak up the juices with good crusty bread. 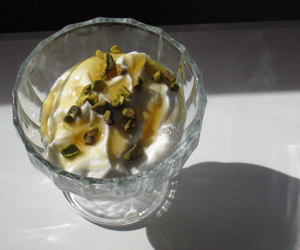 For dessert, drizzle Greek yogurt with thyme honey and top with pistachios. This entry was posted in Food & Drink, Greece and tagged Feta, Greek, Greek salad, Kalamata, Olive, Olive oil, Oregano, Tomato by yalla2013. Bookmark the permalink.